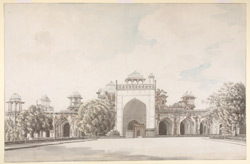 Watercolour by William Hislop (d. 1829) of Akbar's mausoleum, from the north, at Sikandra near Agra in Uttar Pradesh, dated to the 1820s. The village of Sikandra was named after Sikander Lodi (1489-1517), the sultan who established his court at nearby Agra in 1504. The Mausoleum of the Mugahl emperor Akbar (r. 1556-1605) is set in a huge garden surrounded by battlemented walls with a red sandstone gateway in the centre of each one. The ground-level storey comprises a set of arched recesses. At the centre of each facade is a tall rectangular central gateway topped by a marble kiosk. There are four tiers of trabeate pavilions built above the arcaded ground floor. The burial chamber lies deep within the building and on the top floor is a replica tomb, placed exactly above the grave further below, inscribed with the ninety-nine names of Allah and carved from a single block of marble. During Akbar's reign he encouraged a synthesis of Hindu and Islamic artistic traditions. His tomb may be seen as a culmination of this syyle although the building remained unfinished at his death and was completed by the Emperor Jahangir.